Fight Back! interview with Jose Maria Sison on struggle against U.S.-backed Duterte regime | Fight Back! Fight Back! 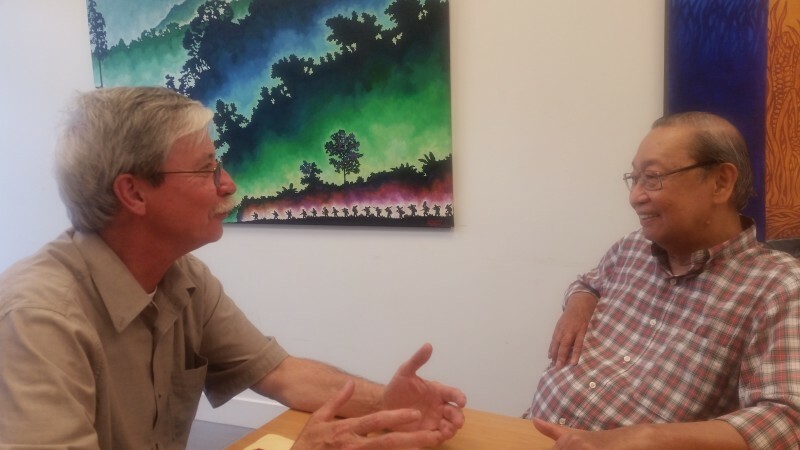 interviewed Jose Maria Sison, the founding Chairman of the Communist Party of the Philippines, August 18, in Utrecht, the Netherlands. The interview was conducted by Fight Back! editor Mick Kelly, who is also responsible for the international work of Freedom Road Socialist Organization (FRSO). Fight Back! : What has the Duterte regime meant for the people of the Philippines? Jose Maria Sison: Well, the Duterte regime is seen as a tyrannical, corrupt and overspending kind of government. What now outrages the people most is not so much Duterte calling God ‘stupid,’ but it's a more mundane thing, like the rising prices. The soaring prices of basic commodities and services have come about because of the increase of the tax burden at the expense of the consumers. There is tax cut-backs for the big bourgeoisie and other exploiters, but the taxes in the form of excise taxes, which is put into the price of commodities, so it's something inescapable - and this causes inflation. The inflation rate is going up. Then of course, people are already cognizant of the fact that Duterte is simply killing the poor people in this war on drugs, in order to intimidate the people with mass murder and with impunity - and the presidential protection that the police are given, no? And then the cash rewards, too. It's now well known that Duterte's favoring his own group of drug lords. He's practically the supremo of the most dominant group of drug lords, including his son, who has been exposed as smuggling, smuggling illegal drugs in a big way. Fight Back! : So, what's the state of the resistance? Sison: There is a broad united front that has come about. The best-known manifestation of that broad united front is the movement against tyranny. The issue of human rights is the issue that has brought people together, and the people are concerned with the use of the Tokhang [extrajudicial killings] methods against the poor. Also, the use of practically the same methods in Oplan Kapayapaan [a counterinsurgency campaign of the government], which is directed against the revolutionary forces. Now what are those methods? People are asked to surrender themselves, as in the case of the war on drugs, as drug addicts or pushers, so that they would be cleared, no? And they could even get rehabilitation. But the list is a death list. Because the police officers are given orders to kill a number of people from day to day. And the same methods are used in the Oplan Kapayapaan. You know, you read from the newspapers about mass surrenders and killings and encounters, but those are fake surrenders and fake encounters. Now, a list is drawn up of people who belong to the revolutionary movement. They say, well, some of the NPA (New People’s Army) full-timers, live in the community, or they belong to the People's Militia, or they belong to the self-defense units of the mass organizations, or they are related to NPA full-timers, so they are encouraged to surrender, to have themselves listed down as NPA. They are misrepresented as surrendering. But the list is also used for killing. It's also a death list. Fight Back! : Okay, so, there were huge demonstrations at State of the Nation Address (SONA), so there's a huge mass outpouring against Duterte, no? Sison: Yes, the People's United SONA is a signal event. Despite the inclement weather in the stormy Philippines, 40,000 people were assembled in order to demonstrate against the SONA of Duterte, the State of the Nation address, no? All over the country, thousands also made their demonstrations, so you can say hundreds of thousands on a nationwide scale, and this is just the beginning. So, we expect in due time the mass actions will grow until such time that military and police officers would express dislike or even withdraw support from Duterte. Fight Back! : So, will Duterte be overthrown or pushed out of office? Fight Back! : How is the people's war progressing? Sison: The people's war is progressing. So, there is a national spread reaching the three big island groupings in the Philippine archipelago. The NPA is operating in 110 guerrilla fronts - at least 110 guerrilla fronts. They are in 73 out of 81 provinces. The enemy thinks 40% of the strength of the movement is in Mindanao. So there is a concentration of enemy forces in Mindanao. 75% are in Mindanao. That's a total of 75 maneuver battalions in Mindanao. 44 are against the NPA, and 31 are against the Bangsamoro groups. Now, only some 25 maneuverable battalions are spread on the wider scale of Luzon and the Bisayas. They are thinly spread here. So it's easy for the NPA to launch offensives where the enemy is more dispersed and spread thinly. But even in Mindanao, there is a lot of experience for the NPA there in dealing with concentrated forces. The encircling forces have big gaps. So points in the encirclement - can be hit, no? Or the NPA can just win, no? And if the encircling forces send into the NPA area small units, platoons, let's say, they can be ambushed. So the NPA in the Mindanao knows how to do counter-encirclement against outposts in the perimeter as well as troops, small units sent into the areas of the NPA. They have been so good - the NPA has been so good in this kind of warfare because during the last 15 years, they were able to create new guerrilla fronts outside of the area being concentrated on, no? Northeast Mindanao. So they were able to create in north, central Mindanao and in southwestern Mindanao and southern Mindanao. Fight Back! : Okay. So the NPA is growing stronger, more people are living in the revolutionary areas, and basically the red political power is expanding. Sison: Yeah, the NPA has a mass base of some millions of people. You see the NPA does not only have its auxiliary and reserve forces - like the People's Militia per village and the defense, self-defense units within mass organizations. Then you have the mass organizations enveloping those forces with some amount - at least with some amount of arms, you know? Related to the NPA, no? Then the unorganized masses, they are the targets of expansion work. So there's a people's government with several committees to make sure that there is effective governance involving mass organizing, mass education, production, finance, self-defense, health, and sanitation, environmental protection and settlements of disputes. Fight Back! : Very good. So finally, and by way of a conclusion, what message would you have for progressive people and revolutionaries in the United States? Sison: I would appeal to the progressive forces in the United States to continue and amplify their solidarity and support for the Filipino people's struggle for national liberation and democracy against U.S. imperialism, feudalism and bureaucrat capitalism. I think support from the imperialist country which props up the puppet regime in the Philippines is very important. This was demonstrated during the U.S. war of aggression in Vietnam. The U.S. was using all kinds of military force in order to beat the Vietnamese people, but they could not succeed because the self-reliant struggle of the Vietnamese people was supported and augmented by the anti-imperialist and democratic mass movement in the U.S. which opposed imperialism, as well as the wars and plunder that imperialism unleashes.